The accumulation of pus in the teeth, gums, or nearby bone is called a dental abscess. It is a serious form of dental emergency, and unfortunately not many people know it. At Ria Family Dental, we have same-day emergency appointments to relieve you of your pain as soon as possible. Read on to learn more about dental abscess and its accompanying risks to your oral health. A dental abscess is an accumulation of pus caused by an infection. Pus is a whitish-yellow protein-rich fluid composed of dead white blood cells. It occurs one or two days after an infection sets in. Once it develops, no first aid step can make it go away. Only your dentist can effectively treat a dental abscess. 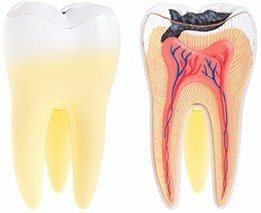 Left untreated, the infection can spread to the root of the tooth and ultimately to the rest of the body via the bloodstream. As noted, once a dental abscess develops only your dentist can make it go away. The following first aid steps will help you manage and subdue its effects before your trip to the dentist. Use an antiseptic mouthwash to rinse your mouth. You can also use a salt water solution (1/2 teaspoon of salt to eight ounces of lukewarm water). Peppermint tea can also be used as gargle. Apply clove oil to minimise pain or take OTC pain relievers, but always be mindful of their restrictions. Never put an aspirin directly to the gums. This can cause a chemical burn. Determining the cause of the infection is crucial in the treatment process. By treating the cause the dental abscess can be treated, otherwise it will persist. In case of a dental emergency, call and visit your trusted Ria Family Dental team. We have same-day emergency appointments to relieve you of your pain as soon as possible.